No one doubts that the 2014 World Cup in Brazil, the country of football and the nation of partying, will be memorable. But there are doubts over how well organised it will be. Brazilian President Luiz Inacio Lula da Silva reacted angrily to concerns voiced by officials from football's governing body Fifa, after the end of this year's World Cup, that Brazil was still far from ready to host the tournament in four years' time. "There are already people asking where are Brazil's airports, buses, railways and stadiums? They talk as if we were a bunch of idiots who don't know what we have to do nor how to define priorities", said President Lula at the launch of a high-speed train set to link Sao Paulo and Rio de Janeiro. But the fact is that Brazil does not have much to show more than 30 months after it learned it would host the 2014 World Cup. There have been severe delays in all 12 cities chosen to stage matches, particularly in the construction of stadiums and upgrading of airports. Brazil is experiencing one of its best economic periods in decades, so there are resources to carry out the necessary works. However, there is a lot of red tape to cut through, as well as politics, as most of the investment will be made with public money. In some cities there are major infrastructure challenges that relate not only to the World Cup but also to the country's development in general. "What is true, and very serious, is that for the last 25 years Brazilian economy did not prepare itself for this moment (of growth)," Lula conceded right after complaining about Fifa's remarks. The state of the airports is a good example. Investment is long overdue and the main airports in Brazil are already operating much beyond their capacity. Sao Paulo International - the biggest airport in Brazil - was planned for up 17 million passengers per year but in 2009 its two terminals handled almost 22 million. There have been plans since 2001 for a third terminal but nothing has happened. On Monday, President Lula signed a bill to speed up the renovation and expansion of airports with a total investment of $3bn, but there are concerns about the time left to carry out the rebuilding work. "I am not so worried about the arenas because you can build a stadium in 30 months after you have an engineering project ready, and we have 47 months to the World Cup," says Jose Roberto Bernasconi, president of the National Association of Engineering and Architecture Companies. "But airports are a more complicated matter and I think that is our main problem nowadays," he said. "The problem is all airports are state run. We should have established long ago public-private partnerships to invest in the airports." Mr Bernasconi points out that the longer the delay, the more expensive the construction will be. "The PanAmerican Games in Rio de Janeiro (in 2007) had an initial budget of some $270m but ended up at least three times as expensive because things were left to the last moment." In Brazil most people believe that the county will be able to organise the World Cup but there are concerns about how well the money will be used. "We always hear so much about corruption in politics, in Brazilian football. And there is so much money involved in a World Cup that it will tempt many people," says student Daniela Mendes. "But if South Africa managed to do it, why wouldn't we?" Most of the planned investments for the World Cup are state-sponsored. Federal and local governments in Brazil have pledged a total investment of some $13bn to boost the country's infrastructure. The bulk of the money - $6.4bn - will be spent on much-needed upgrades in the public transport systems of the host cities with the hope that the investment in the World Cup will have long-lasting effects on people's lives. In Rio de Janeiro, the 26km of transit bus corridors, to be built for the World Cup (and for the Olympic Games in Rio two years later), have been described by Mayor Eduardo Paes as "the biggest investment in Rio's public transport in 30 years". 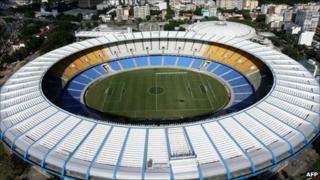 Rio de Janeiro is likely to host the final of the 2014 World Cup in its famous Maracana stadium. The contractor that will carry out the renovation of the stadium - built for the 1950 World Cup - will not be announced until the end of the month. The city authorities say it will be ready by 2012, but as in most stadiums across the country, nothing has actually happened on the ground yet, says Mr Bernasconi. "I am sure Brazil will catch up in time but we have certainly wasted a lot of time already. Brazil has known for almost three years that it would host a World Cup and nothing has been done yet." "The government should also focus more on boosting the interest of private business in the World Cup. It is a unique opportunity to boost tourism in the country and to show the 'Brazil brand' abroad," says Mr Bernasconi. The Brazilian National Development Bank (BNDES) has made $563m available to lend to private hotel projects, because many towns will have to build more rooms. The authorities also have agreed to spend $414m on upgrading ports where cruise ships could function as hotels. There are also concerns over how crime - particularly in Rio de Janeiro - could threaten the safety of visitors and harm Brazil's image. The government is expected to announce specific plans to deal with those concerns - under the coordination of the Ministry of Justice - once the host cities go ahead with their plans for stadiums and hotels. Rio's mayor is convinced that visitors will have nothing but a great time in his city. "Rio de Janeiro will be ready for the World Cup. People should come, because if they don't they will be missing a great party", Mr Paes says.